Fewer than 24 hours to go! My short story, “Matryoshkas”, is available to read on the FiLiA website! This gives a taste of my fiction, my PhD work, and sheds some light on how history and fiction can blend in a way that is both artful (I hope) and factual [see previous post for more of my thoughts on that]. Do take a look! And many, many thanks again to the FiLiA organizers for this amazing opportunity. Can’t wait to give my presentation next Saturday morning! Photo: Maria Spiridonova, Alexandra Izmailovich, Rebecca Fialka, and other Socialist Revolutionary women, Siberia. On October 14th I’ll be presenting on female friendship in the Russian Revolution at the FiLiA feminism conference in London (October 14-15)! I will also be reading a short excerpt from my novel inspired by these radical women. It is an honor to be approached, and the two-day symposium promises lots of incredible learning and networking opportunities for all. Photo: Inessa Armand – revolutionary mistress of sass, hats, and men. “I implore you, though, not to follow my example. Only in this. In all other ways, as is well known, I am perfection.” ~ Inessa Armand, letter to her children from exile in Mezen, Siberia, 1907. 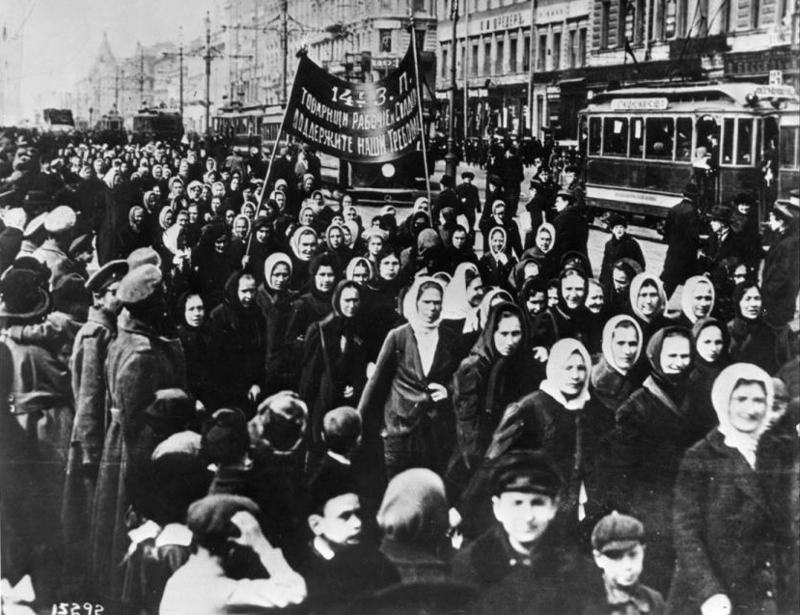 The women of Petrograd took to the streets on March 8, 1917 (February 23, Old Style), International Working Women’s Day, demanding bread and an end to the war; within a week, the Tsar had abdicated, ending 300 years of Romanov rule and many centuries more of Russian autocracy, and women had won the right to vote. It was the beginning of a long, bitter struggle, whose optimistic beginning was so at variance with its bloody conclusions. But it is worth remembering that the fight for peace, land, and bread – those fundamental human needs which would come to be a successful (if co-opted) slogan for the Bolsheviks – began with the women of the Russian capital translating their outrage into action. Like women in the Britain and the US, World War I opened up a vast array of opportunities for Russian women to enter further into the world of work, including fields traditionally dominated by men. By 1917, women in Russia accounted for more than 47% of the labour force. The struggle, of course, was that now working women were fulfilling three full-time roles: as working women, covering for the missing male workers, and still carrying the full burden of domestic duties such as minding the children, keeping the house, balancing the books, and finding food. It was an impossible task, one repeated in industrial and agricultural centres alike. And as the tide turned at the front, while Russia’s casualties mounted and victories grew rare, as prices rose and goods became scarce, the mood of the Russian people, and particularly the women, began to turn sour, and, in the words of historians Jane McDermid and Anna Hillyar, “pushed the women to dissolve the already tenuous division between ‘economic’ and ‘political’ demands” (146). Women had been striking throughout 1916, protesting their working conditions, their pay, and their treatment by management. Thus, the events of March 8, 1917 did not spring from a void; it was the finale of one movement and the opening act of another. The underground radical movement in Russia, manifested in myriad left-wing illegal political parties, had, thus far, largely failed to tap into the rich vein of feminine dissatisfaction. The Bolsheviks and the Inter-District Committee had gone furthest in this direction, with some women actively campaigning among working women, raising political consciousness and attempting to organize them along political lines. The war had been a turning point in the party’s efforts to recruit women, and it had been the women in the party who had recognized the opportunity it presented. “the issues which appealed to women workers, and around which revolutionaries agitated, were rarely acknowledged by them as political. Instead, they were seen as fundamentally material concerns, which could only draw women to the class struggle temporarily. To recruit the minority of politically conscious women workers to revolutionary organisations, their awareness had to be raised from such ‘bread and butter’ concerns to the higher plane of politics” (Revolutionary Women, 149-150). Working women, as gentle but emotional and ill-educated creatures, weren’t considered worth the trouble of recruiting at this stage. Working women were about to prove their mettle in no uncertain terms. In fact, several women, such as Bolshevik Maria Vydrina, were eager to make a display on Women’s Day. The party insisted that the workers weren’t intellectually prepared for any immediate action, and planned a demonstration for May Day; the women could wait until then. Vydrina, who had been a Bolshevik for five years, since the age of seventeen, disagreed, and helped organize the march in the city for International Working Women’s Day. And she was not alone. Anastasia Deviatkina had been a Bolshevik for 13 years, and she also stepped up to lead a demonstration that day. J. Butler Wright, an American diplomat, noted the shifts taking place. “The Cossacks are again patrolling the city on account of threatened strikes – for the women are beginning to rebel at standing in bread lines from 5.00 A.M for shops that open at 10:00 A.M., and that in weather twenty-five degrees below zero.” One tsarist official informed his superiors at the end of January that it was women, “mothers of families, who are exhausted by the endless standing in line at the stores [are] a store of combustible material. One spark will be enough for a conflagration to blaze up.” Another American, photographer Donald Thompson, saw “dozens of machine-guns” had appeared on the roofs of Petrograd buildings during the night of February 22nd. Two things happened simultaneously: in one part of town, as observed by Thompson and his colleague Florence Harper, a large crowd gathered at the Field of Mars, the drill ground and site of military memorials; in the Vyborg district, women textile workers downed tools and left their factories, taking to the streets. No mere bread riot, this. The women in the Vyborg district were ready to head into the city, but they faced opposition, first from their male comrades who said “it is not the business of babas [women]”, and then from police who closed the bridges in an effort to keep them from crossing. But it was still winter in Petrograd, and so they crossed the frozen Neva on foot. “In skirmishes with police and troops, some were killed, buried in common graves, their names unrecorded” (Midwives, 125). The women needed more bodies in their ranks, and more power on their side. So they turned their attention to the tram systems, and to the soldiers. The war had depleted the stock of able-bodied men, and so women had largely taken over the running of the Petrograd tram system. And these women, as overworked, underpaid, and underfed as their counterparts in the textile factories, had had enough and were ready to take a stand. One, “who admitted that she feared the outcome of the demonstration…recalled that she shouted along with the rest ‘Down with the tsar!’” She did not know what would replace the tsar, but she knew the time had come. Another tram conductor, Alexandra Rodionova, recalled her excitement: “I yelled ‘Down with the tsar!’ and it seemed to me that I had lost touch with solid ground and flew in giddy uncertainty. Yes, I had participated in many strikes and demonstrations. But this had happened secretly; I had never taken a clear political position. And suddenly, all at once, the unknown future became real.” When the conductors had joined the crowd, the women took to destroying the trams to be used as barricades against the police, forcing them to stop, evacuating passengers, throwing control handles into the snow and tipping the cars ‘until the blocked cars extended all the way along the Sadovaya to the Nevsky Prospekt’, barricading themselves against the police and troops which would be sent to disperse them. And the passengers, including one of wounded soldiers and nurses, joined in, singing the Marseillaise along with the crowd. Winning over the soldiers was the next step, and one which was made surprisingly easy by the groundwork done by revolutionaries, especially women, and by the war itself. Many of the men stationed in the capital had come from the countryside as reserves to bolster the dwindling wartime supply; many of the factory women had also come from the countryside, seeking higher pay or war work. Their shared background worked in the women’s favor, for they were able to convince the men not to shoot at their own folk. The working women showed the soldiers that their struggles were mutual ones. Over the course of the week, allegiances began to shift. In Petrograd, Zhenya Egorova (born Ella Lepin) distributed leaflets and organized meetings of soldiers within their barracks. (At age 25, she had been a Bolshevik for six years and had already spent a year in Siberia.) Even in Moscow, as things gained momentum, Maria Kostelovskaya, another Bolshevik, assembled twenty-five soldiers with whom she occupied a printing house. There was no underestimating the strategic power of a sympathetic army. And the women had ensured the support was on their side. “On the eve of International Women’s Day, armed soldiers stood outside the depots; by the end of 23 February, they had joined the workers inside” (Midwives, 152). Meanwhile, in the enclaves of the revolutionary underground, there was chaos and confusion. Their dismissal of women as agents of political change meant they had neither expected the women to rise up so swiftly, coherently, or successfully. They were now left chasing their tails, trying desperately to figure out how to capitalize on an event they had neither the foresight to prepare for by a demographic they now had to begrudgingly respect. There is much to be said of the aftermath, of course, and it is nearly impossible to analyze the February Revolution objectively in the twenty-first century. But the February Revolution is an enduring reminder of the power of masses of mobilized women, a lesson which is as prescient today as then, one hundred years on. If there is change we want, on local, national, or global levels, then we must act. And as the women of Petrograd showed, solidarity is key. Happy International Women’s Day. Let’s get to work. Sofia Lvovna Perovskaya (September 13, 1853-April 3, 1881) was always conspicuous by her difference. In a wealthy family, notable for gregarious, sparkling banter and luxurious gowns, a reserved young lady in demure dress is bound to stand out. She was determined to amass knowledge, and plagued by the urge which infected so many Russian youths in that generation: to live a useful life. Of course, in a society whose investment in women’s intellectual advancement was notoriously poor, these were lofty goals indeed. The situation was hardly helped by her tyrannical father, who spent much of his time terrorizing her timid, tender mother, turning on Sofia when this target wore out. He was Governor-General of St. Petersburg, product of a family descended from royalty whose members occupied some of the most prestigious positions in the Empire; conservative and reactionary, he despised Sofia’s urge to learn, keeping her out of school and without a tutor for much of her youth. But arguably it was he more than anyone, with his tempers, his repression, and disdain, who inspired her to pursue education and rights for women, the protection of society’s most vulnerable members, and, eventually, revolution and terrorism. In light of her father’s edict on school and tutors, Sofia took the onus of her education onto herself. She gorged herself on books, taking in whatever information she could wherever she could get it. At around this time there was a tremendous upsurge in the Russian women’s movements, and young ladies (typically of a respectable social standing) were opting to pursue education wherever it was available. Sofia was one of them; she joined the Alarchinsky University for Women in 1869, running away from home at just fifteen. Always, her target and aim was the improvement of the lives of the people. Whether it was propagandizing among the youth, or the factory workers, or the peasants, or going “to the people” with others of her generation who took up magnanimous positions such as farm laborers, educators, or in Sofia’s case, nurses. She worked as a smallpox inoculator, in factories, and set up a home to educate workers; in the end, she received diplomas as both a teacher and a medical assistant (assistant only, despite her capability, on the grounds of being a woman). Throughout 1873 she maintained several safehouses for the socialist movement, so much of which was directed against Tsar Alexander II. Then, in 1874, she was arrested with Alexandra and Lyubov Kornilova for undercover propagandizing among the workers, and was held in the Petropavlovskaya Fortress – notorious for its poor conditions, the tomb of myriad revolutionaries before her. Her position as a young woman of influential family meant she was allowed to await trial on her parents’ estate in Crimea, though only because the authorities had no evidence to hold her with. Unable to devote herself to her work for fear of compromising her comrades, and never one for idleness, she spent the next three years working as a doctor’s apprentice in Simbirsk Province, then attending a doctor’s apprentice course in Simferopol. Her privileged position worked in her favor before the jury, as well. At the Trial of the 193, where the defendants were an assemblage of students, youths, and radicals accused of causing unrest in the provinces and spreading propaganda against the Empire and Tsar, she was acquitted on January 23, 1878 (the day before another radical woman, Vera Zasulich, shot General Trepov as a reprisal for his order to flog a political prisoner). Sofia, knowing the authorities were outraged by her acquittal and Zasulich’s crime, went underground to escape re-arrest. She spent a year exhaustively organizing armed escapes of convicted comrades, going to Kharkov for money and materials, but her efforts were generally unsuccessful – this compulsion to liberate her imprisoned comrades would be a recurring strand of her political and revolutionary life until her death. At this time, she joined Land and Liberty, the radical group calling for a revolt among the peasants. She was arrested at her mother’s home in Crimea but managed to catch a train and escape en route to exile. When the party split into two factions over whether or not terrorism was a viable political tool, Sofia was left with a choice: Black Repartition, favoring rights for the peasants by means of propaganda, agitation, and strikes, or Narodnaya Volya (the People’s Will), who aimed to attack Russian autocracy at its source, Tsar Alexander II. After some persuading, she tentatively chose Narodnaya Volya, along with Tatiana Lebedeva, Anna Korba, Gesia Gelfman, Anna Yakimova, and Vera Figner, as well as a number of others. Her work in the group was hectic and intense, plotting constantly to kill the tyrant figurehead and free the people. The first plan was to blow up the Tsar’s train. She posed as wife of comrade Lev Gartman and moved into a house near the Moscow railway line, helping dig the tunnel from the house to the tracks where they would place the explosives. Sofia twice protected the tunnel from police discovery; in case they were raided, it would be her responsibility to shoot at a bottle of nitroglycerine, thus blowing up the police, comrades, house, and herself. She faced death unafraid, but thought it prudent to use charm and wit to distract the police in their search, and keep the evidence better hidden. The work was getting increasingly dangerous, but their determination only grew hotter with each passing day. At last, they were ready to set their plan in motion. On the night of November 19, 1880, Sofia and her comrades journeyed to the prearranged spot, just outside Moscow, and hid among the bushes alongside the railroad line. She peered at the tracks under cover of darkness, waiting in tense but patient silence for the Imperial train. Traditionally the Tsar rode in the second coach, and so as the train approached she let the first go; however, the Tsar had been in the first coach after all, and the explosion wound up killing servants and soldiers of the Emperor. Devastated by their failure, and miserable at having killed innocent civilians (of the proletariat no less), the group made their weary way back to the city. Now she now joined Narodnaya Volya in an official capacity, having proven herself invaluable with her cool head and searing conviction. She was the first woman on the Administrative Committee and Executive Committee, taking a leading role alongside Andrei Zhelyabov in the planning and executing of their schemes. They planned to try again, determined this time to do it differently, and do it right. But success was never guaranteed, and their second attempt, this time to blow up the Kamenny Bridge in the capital as the Tsar passed over it, was equally ill-fated. The mission in February 1880 to blow up the Tsar in his dining room, planting an agent in the Winter Palace and stocking his room with dynamite, only resulted in the death of a handful of servants. Narodnaya Volya, desperate in light of their failures, agreed to suspend their campaign if the Tsar would issue the Russian people with a constitution. But the constitution would never grant freedom to the Russian people, and this period witnessed the birth of the Okhrana, the Russian secret police responsible for “internal security”, i.e. tasked with targeting and suppressing seditious groups of any persuasion. Met with repeated failure and hunted on all sides, spirits in Narodnaya Volya were low that winter. Somewhere, through the flurry of producing propaganda literature, avoiding the clutches of the local gendarmes, and plotting and attempting to assassinate the Tsar, Sofia Perovskaya fell in love with Andrei Zhelyabov, her closest comrade. With his great height and exceptional beard, he looked slightly mismatched beside the diminutive, childlike Sofia; yet the meeting of the minds between them was extreme and inevitable. They each understood one another, their ambitions, their reasons, their mission, the struggles of life as an underground radical and as a terrorist; these were circumstances few others of their acquaintance could truly grasp. While many in the early years of Russian revolutionary work regarded personal relationships (read: romantic and sexual relations) between party members as a selfish distraction from their work, others, such as their comrade Lev Tikhomirov, saw such unions as a positive. The strength and depth of her feelings for Zhelyabov were in harmony with her political work, not conflict; she had passion enough for both. On the wings of love, the work flew on. For the next mission, Sofia posed as the wife of their comrade Nikolay Sablin in Odessa; their plan was to blow up a street the Tsar often passed through en route to Crimea. The revolutionaries found a shop and dug tunnel for mines with the help of Vera Figner. Once again, they miscalculated, and he went by sooner than anticipated. The Committee instructed them to wind down efforts with the mines, so they changed their target to Count Totleben, representative of the governor-general system (which had been introduced in spring of 1879 in six special regional commands as a response to revolutionary activity). Before they could come up with a safe, concise means of killing him, he was transferred out of Odessa. Disheartened, but not beaten, Sofia and Sablin left Odessa. Now, in the early months of 1881, the third plan to kill the Tsar was drawn up to take place on the first of March. Having observed his movements, particularly his Sunday trips to the barracks, they mapped out his potential routes through the capital and decided to spring at the most likely point. On Malaya Sadova Street they once again set up a shop façade, filled with explosives, which they would set off when the Tsar passed by. But the terrorists had been thwarted one time too many, and decided to prepare a backup plan. They asked the Executive Committee how to proceed on March 1 if the Tsar did not go down Malaya Sadova Street as planned; the response was “Act in any case” and a contingency plan was drafted. Rather than commit themselves to one location with mines, nitroglycerine, and dynamite, they began building projectile shells which could be carried and thrown from any location. This is one of the earliest instances of projectile explosives, and without any previous experience the work was all the more dangerous; indeed, their principal bomb builder was injured on the job, leaving Anna Yakimova to finish constructing them on her own. But what they lacked in experience they made up for in conviction, and the bombs were completed. Sofia was perhaps more anxious than any of them in the days and hours preceding the assassination attempt. Zhelyabov had been arrested on the night of February 27, and her fear for his safety was not tempered by fear that he would give them away; she trusted him implicitly. But it did mean she was now the leader of Narodnaya Volya in his stead, responsible for their most ambitious undertaking. She spent the night of February 28 in Vera Figner’s flat, resting for the next day at Figner’s insistence; the women were up and ready at 7am. On March 1, 1881, Sofia brought the bombs from Vera Figner’s flat to Gesia Gelfman’s, then delivered them to the bomb-throwers whom she positioned along the Ekaterinsky Canal before she crossed to the opposite side, ready to alert them in code with a white handkerchief. Anna Yakimova was keeping watch, and when the Tsar did not pass the shop on Malaya Sadova Street, it meant that Sofia and her band of assassins were the last chance. She waved her handkerchief, and Nikolay Rysakov threw the first bomb. The damage was restricted to the horse and a few guards; against the advice of his entourage, the Tsar emerged from his carriage to inspect the damage and offer comfort. Rysakov, already apprehended shouted something, and, worried there were more revolutionaries in the swarming crowd, again the entourage begged the Tsar to return to the carriage and leave the scene. But it was too late. Ignacy Hryniewiecki ran forward, throwing another bomb; Ivan Emelyanov stood by, ready to throw a third should this comrade be unsuccessful. But Hryniewiecki was too close to miss, or to survive. The street was in chaos, blood and debris and body parts decorating a black circle of scorched earth. The Tsar, maimed and bleeding, was rushed in a sleigh back to the palace, but was no use. Narodnaya Volya had assassinated Tsar Alexander II. Sofia Perovskaya was sentenced to death. She was the first woman hanged in Russia for a political crime, on April 3, 1881. The wisdom of assassinating an Emperor whose nickname was “Tsar Liberator” has been debated ever since. Arguably Alexander II was among the least authoritarian Tsars of the modern age; certainly he was more liberal than the son who followed him, whose conservative outlook was warped to fanaticism after the murder of his father by revolutionaries. The abolition of serfdom, Russia’s feudal slave system, had been long anticipated, but the application was not as smooth as the theory. The system as it was constructed created more financial difficulty for the peasants, creating massive dissatisfaction. No matter what liberal reforms Alexander instituted over his nearly 30 year reign, be they military, judicial, or political, they never quite went far enough for the liberals or the people. It was a pattern that would repeat itself with his even unluckier grandson, Nicholas II, who only relinquished the smallest power, conceded even the most minor rights, with greatest reluctance, and paid the ultimate price for it. Note: Perovskaya became something of a muse after death, inspiring ballads, poems, operas, and paintings. The title and the following stanzas are from one such tribute. The nations struggling to be free. Will raise to life a patriot host!